APIs, API Business Hub and API Management: What´s new in TechEd ´17? 2017 has seen tremendous growth in the digital economy. Digital business platforms like the SAP Cloud Platform (#sapcp) are enabling traditional enterprises to become digital businesses. APIs are the new digital atoms fueling this transition to digital businesses, helping enterprises new business models, revenue channels and take advantage of trends such as IOT and AI. Now is your time to Unleash your Killer API with SAP Cloud Platform and the API Management services. SAP applications, platforms, and business networks continue to open up through APIs – to facilitate ecosystem-driven innovations and seamless integration – through the SAP API Business Hub. The SAP Cloud Platform, API Management services allow customers to manage the full-lifecycle of their digital APIs and win in the digital economy. 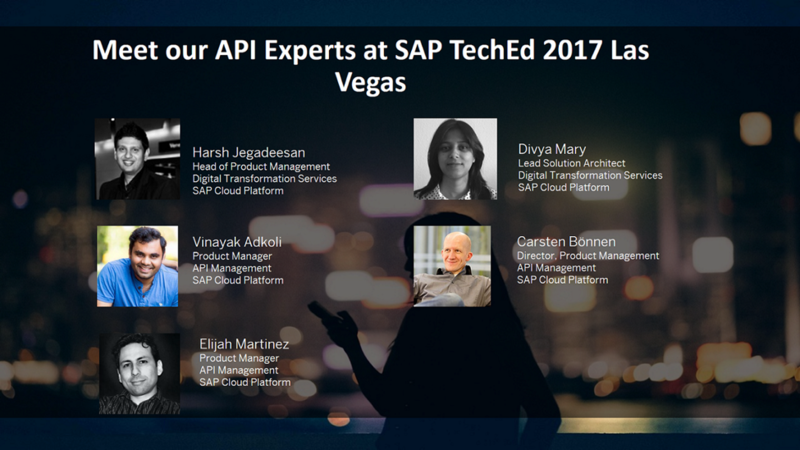 In this blog, you will learn about the new digital content and the innovations announced at SAP TechEd 2017. Rich and expanding APIs and accelerators: Do more with more! Communication APIs: Leverage APIs from SAP Digital Interconnect LiveLink 365 – SAP´s communication platform – for your global messaging needs. Send SMS, emails and support multi-factor authentication using the APIs. AI and Machine Learning: Use new machine learning and AI capabilities from SAP Leonardo Machine Learning platform through API for document feature extraction, language detection, and similarity scoring. Get started here. Growing SAP S4HANA APIs: SAP S4HANA APIs continue to grow, we have a total of 85 APIs across S4HANA capabilities, you can do more with more now. See this video on S4HANA Cloud APIs here. API Sandbox is now available for S4HANA APIs and you can easily discover, learn and build sample applications with the API Sandbox. My colleague Hassan has a great blog on this to get you started. Business-to-Government (B2G) interactions made easier: Across different countries, businesses are interacting with governments digitally. We provide pre-packaged integration packages to accelerate B2G integrations. For example, enterprises in Spain can quickly comply with the VAT regulations by sharing VAT register books with the tax agency with pre-packaged integration package. Industry-specific APIs from partners: Teknoleum – an SAP StartupFocus start-up – provides a hydrocarbon quantity conversion API for oil & gas industry. The success of digital business platforms is determined by how easy it is for the ecosystem of partners, independent developers as well as customers to onboard and start using the platform through APIs. SAP stands for openness and choice and we have chosen the Open API Specification as an open-standard to design, document and list our enterprise APIs. All APIs in the API Business Hub are available as Open API Specification. SAP is also leading the Open Data Protocol (OData) initiative to easily enable data sharing across the enterprise. All SAP OData APIs are now documented as Open API Specifications. SAP has now formally joined the Open API Initiative under the Linux Foundation. SAP believes that we need to democratize API consumption beyond developers. We need to enable citizen developers/integrators and line-of-business users to consume APIs seamlessly to build integrations, applications, and self-service analytics dashboards. To enable democratization of API consumption, we’ve been driving hypermedia, machine-readable OData standards. We would like to actively contribute to the Open API Initiative based on our experience on building long-living enterprise APIs/Interfaces as well as our efforts on democratizing API Consumption. More and more business services are consumed as APIs – we call them Business APIs. We are happy to launch to A new certification will be available for Third Party Business APIs on SAP API Business Hub to ensure technical alignment with SAP best practices & guidelines. Benefits include “Certified” listing on the SAP Business API Hub and SAP Certified Logo. We already have a successful certification for integration adapters and integration packages for SAP Cloud Platform Integration for partners. Now API Business Hub has API Best Practices shipped as Policy Templates. In this blog from my colleague @Shruthi, you will learn more about how the API Best Practices policy templates can be discovered in your API Management tenant and consumed easily. The API Best Practices and templates allow you to easily, securely and quickly expose your data and processes as digital APIs with SAP Cloud Platform, API Management. Leveraging the API Economy is about developing new channels, engaging with a new segment of digital consumers and accelerating revenue growth. Monetizing your digital assets as APIs can´t be simpler than even with API Monetization capabilities in SAP Cloud Platform, API Management. Define API Products, and rate plans, engage with developers and digital consumers and generate new revenue streams. Learn more from this blog by Shruthi M Arjun. API Business Hub natively integrates with tools such as SAP WebIDE and SAP Cloud Platform SDK for IOS. See the new enhancements of SAP WebIDE integration in this 2-minute demo from my colleague Midhun VP. You can roll-up your sleeves and build an app on your own using this tutorial from Meredith Hassett. We have seen other 3rd party tool vendors leveraging API Business Hub to quickly build apps. See the showcase from Mendix on how they built a Financial Services app in flat 10 days using a design-thinking approach. Fascinating! Meet us in TechEd 2017! We are so excited with the latest digital content and capabilities that allow you to accelerate your digital transformation. We have an excellent lineup of speakers and experts to show you these latest innovations and how you can take advantage of them. For more on API Design, Architecture and Strategy in TechEd 2017, see the blog from my colleague Arti Gopalan.